The staff canteen at a local pharmaceutical packaging company has just entered its fifth straight year of complete and total silence. Nobody who works at Abstral Ireland in Tullamore has said a word in the canteen since Joe Delaney finally became the last member of staff to buy a smartphone in 2014. 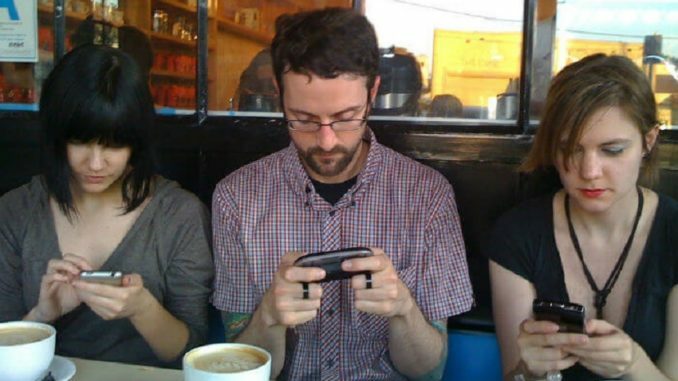 It’s the same story everywhere of course as people up and down the country seem to spend every free minute they have staring into their phones. But it’s not only at the expense of conversation. Recent research has found that there are also serious health consequences such as short attention spans and memory loss. Smartphones however are clearly here to stay. Meanwhile consumer watchdogs have told manufacturers of smartphones to stop making ridiculous, over the top claims about changing the world as we know it every time they release a new model.